What was the Coast Guard’s role in the SS St. Louis affair, often referred to as “The Voyage of the Damned”? 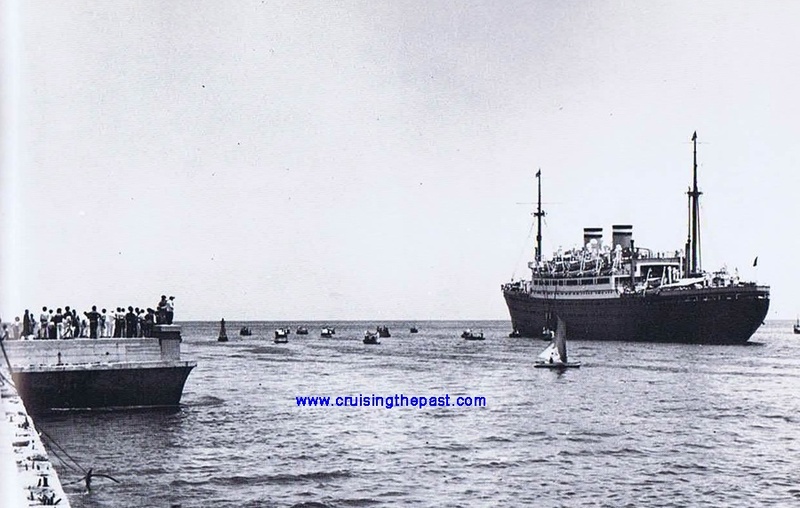 SS ST LOUIS arrives Havana, Cuba. But never docked in Havana Harbor. In the years since the end of the Second World War, the exact role of the US Coast Guard in the so-called “Voyage of the Damned” has been a matter of some controversy. There has been a recent increase in interest regarding the subject. 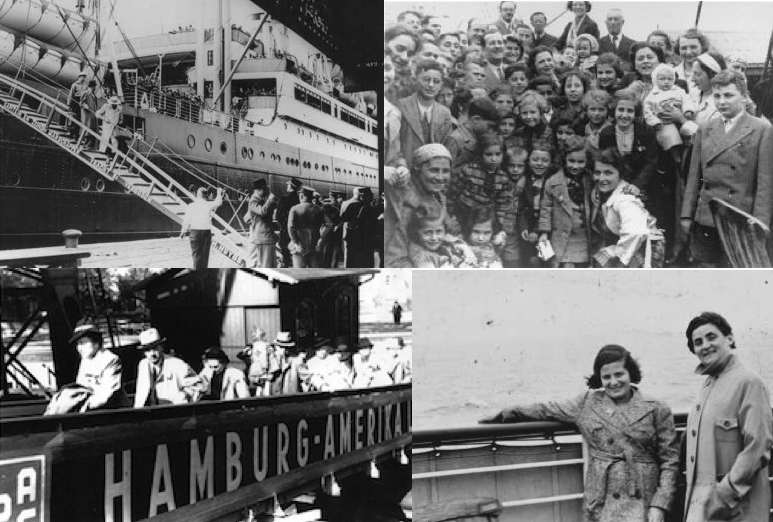 For this reason the US Coast Guard Historian’s Office has chosen to address some of the issues and lingering questions regarding the events of May-June 1939 and this shipload of passengers seeking refuge from persecution in Nazi Germany. 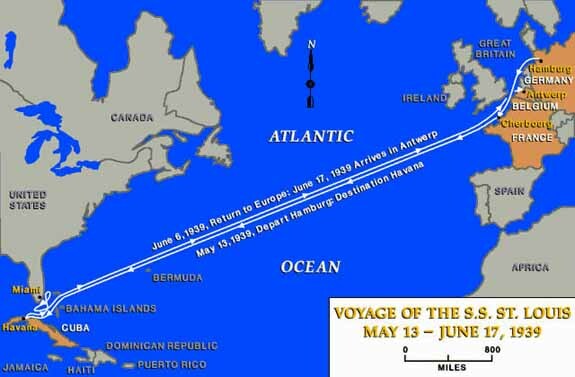 INTERESTING VIDEO: The MS St. Louis departed Hamburg for Havana, Cuba, on May 13, 1939, carrying 937 Jewish refugees fleeing Nazi Germany. 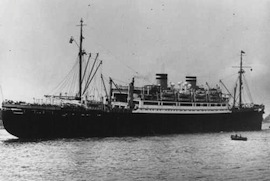 After being refused entry into Cuba upon arrival, the St. Louis sailed aimlessly around the Caribbean, American ports closed to the refugees, before returning to Europe where most of the passengers died in the Holocaust. At least that’s the story of the Hollywood movie “Voyage of the Damned” (1976). The truth is rather different. As Richard Breitman and Allen Lichtman, both historians at American University in Washington D.C., explain in their new book, “FDR and the Jews,” most of the St. Louis refugees actually survived the Holocaust, and many even eventually found their way to the United States after the war. On 13 May 1939 the passenger ship S.S. St. Louis of the Hamburg-Amerika Line steamed out of Hamburg bound for Havana, Cuba. Her passengers were 937 German Jews hoping to escape Nazi persecution and find refuge in Cuba. Just before the ship departed, however, the Cuban government changed the immigration laws (Decree 937). This effectively closed the loophole by which many of the passengers had hoped to enter the country. The new law required the payment of a 500-peso bond and before any alien could disembark and that person needed to have the written approval of the Cuban secretaries of state and labor. Most of the passengers on board St. Louis, however, only had tourist visas that they had purchased from the Hamburg-Amerika Line. Shortly before St. Louis was to arrive in Cuba, Gustav Schroeder, the ship’s captain, received a telegram from the shipping line official in Havana. It stated that the ship had to anchor at the roadstead instead of docking at the line’s pier in Havana harbor. The refugees on board were being denied entry into Cuba. The liner reached the roadstead on 27 May and Cuban officials boarded the ship. None of the passengers, however, were able to disembark. This precipitated negotiations between those who wished to see the passengers landed and the Cuban government of President Laredo Bru. The U.S. Ambassador to Cuba, exercising his own initiative, made inquiries regarding the status of the refugees with the Cuban government. Despite these efforts, the Cuban cabinet on 31 May decided to deny the majority of the passengers refuge. Twenty-two who had acquired immigration visas before departing Hamburg were allowed to disembark. The Cuban government then told Schroeder to leave Cuban waters. Schroeder replied that he had insufficient time to prepare for departure. The deadline was extended to 10:00 AM on 2 June. Under threat of removal by the Cuban Navy, Schroeder weighed anchor on the morning of 2 June. Although St. Louis had departed Havana, negotiations between the Cuban government and those who wanted the refugees landed continued. Instead of returning to Hamburg, Schroeder persisted in steaming off the Cuban coast. After a few days, he turned north toward Florida in the hope that the U.S. government would allow the vessel to make a landing. During this time off the coast of Florida St. Louis encountered a U.S. Coast Guard vessel. Later in his book, While Six Million Died: A Chronicle of American Apathy, Arthur D. Morse claimed that the U.S. Coast Guard cutter CG-244 “shadowed the St. Louis, with orders to prevent any refugees from jumping overboard and swimming ashore.” In support of this claim, Morse cited contemporary newspaper accounts and two interviews. The first of these was with Cecilia Razovsky, a passenger on board St. Louis, the second was with Lawrence Berenson, the lawyer who negotiated with the Cuban government in Havana. These sources, however, could not possibly have known what CG-244’s orders were and therefore, Morse’s claims are fundamentally speculative and unsubstantiated by any official documentation. Despite this fact, Morse’s claims have been oft repeated in the subsequent secondary literature on the subject. Captain Schroeder, in his memoir Heimatlos auf hoher See, asserted that he intended to make an illegal landing along the Florida coast. He claimed, however, that when he attempted to do so Coast Guard vessels and planes arrived to prevent a landing. Faced with these purported measures, Schroeder decided to turn away. This assertion, however, is problematic for a number of reasons. First, the draft of St. Louis was 28 feet 4 inches. This would have significantly limited his options on where he could approach the shore. This is especially true as the maximum depth at high tide along most of the South Florida coast was only 6 fathoms (36 feet). This would have made any attempt to approach the shore hazardous at best. Second, without a port capable of handling a ship of that size, he would have to disembark the passengers via the lifeboats. Jumping overboard and swimming to shore was not a realistic option for the vast majority of passengers. 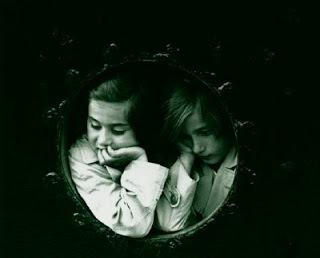 Two young passengers looking out at Havana and unable to get off the ship. With anchoring and off-loading the only real option, the logistics of such a situation, even in sheltered waters, would have been a considerable undertaking both in time and effort. This effort would be further complicated by the fact that the passengers would have undoubtedly wanted to take their luggage with them. The captain would also want to recover his boats and crewmen before departing. It is likely, however, that these men lacked the skill and the experience required to perform such a task in the surf without potential loss of boats, crewmen, and passengers. Finally, the fact that Schroeder’s memoir was published in 1949 is a matter of considerable historical significance. After all, the fates of many of his passengers in the Holocaust would have been known and it may very well have influenced his retelling of the events of May and June 1939. Hans Herlin in his book, Kein gelobtes Land: Die Irrfahrt die “St. Louis,” elaborated further on Schroeder’s claims. Basing his conclusions largely on Schroeder’s memoir, Herlin claimed that the captain was ready to land the passengers when two U.S. Coast Guard vessels appeared. One was numbered 244. The ship was then ordered to move beyond U.S. territorial waters (3 miles). Despite Schroeder’s attempted ruse whereby he claimed that he had engine trouble, the order remained and the ship moved away from the coast. What is not clear, from either account, is where exactly did Schroeder attempt to make land? After all there were a number of U.S. Coast Guard installations in south Florida. Is it not possible that he unwittingly attempted to make a landing in the immediate vicinity of a Coast Guard station? Also, given the reported likelihood that the passengers on board may attempt to make land by jumping overboard, would it not also have been reasonable that these Coast Guard vessels were deployed in order to respond to a potential search and rescue situation? These are all potential explanations of the Coast Guard presence that Schroeder misunderstood and deemed as being counter to his intended course of action. In the end the claims of Morse, Schroeder, and Herlin are largely unsubstantiated by any official documentation. Consultation of U.S. Coast Guard records, U.S. State Department records, and U.S. Treasury Department records in the National Archives do not substantiate any claim that CG-244 or any other Coast Guard vessels had standing orders to interdict St. Louis should she attempt to make a run toward the Florida coast in an attempt to disembark her passengers. Rather, official documentation provided by the Franklin Delano Roosevelt Presidential Library in Hyde Park, N.Y. indicates that the status of the St. Louis and her passengers was of considerable concern to Secretary of the Treasury Henry Morgenthau, Jr. Immediately afterward, at 3:59 PM, Morgenthau contacted Commander Earl G. Rose at U.S. Coast Guard Headquarters in Washington, DC. In this conversation, Morgenthau inquired as to the position and status of St. Louis. Informed that the USCG vessel had lost contact with the ship, Morgenthau wanted to know where the ship was. Furthermore, he wanted this information kept confidential, namely out of the newspapers. Rose gave his assurances that the instructions could be sent out in “a tight code” and safeguarded. He also made it clear that he wished to be notified immediately if the ship were found. Given these conversations it becomes quite apparent that there were no orders to interdict the ship and the US Coast Guard units were dispatched out of concern for those on board, not as is supposed by Morse, Schroeder, and Herlin, to interdict the refugees and prevent them from landing. With no realistic options of landing in South Florida, Schroeder again turned toward Cuba in the hopes of landing on the island. Negotiations with the Cuban government, however, had ended with the passengers not being allowed to enter the country. With few alternatives, Schroeder and the passenger committee on board St. Louis decided to return to Europe. A number of countries, namely France, Belgium, the Netherlands, and Great Britain, accepted groups of the passengers after the ship docked in Antwerp, Belgium. Those on board finally disembarked, bound for new homes. Thus, ended the ill-fated odyssey of the St. Louis. For many of the passengers on St. Louis, unfortunately, refuge in France, Belgium, and the Netherlands provided only temporary relief from the Nazis. Within a year German armies invaded and conquered most of Western Europe. Many who had seemingly escaped the Nazis found themselves deported to concentration camps and ghettos in Eastern Europe. Most would perish in the Holocaust. Previous: The LOS ANGELES STEAMSHIP COMPANY… USC rooters heading north for Stanford game on the SS YALE!